The second generation of the mid-size Mercedes-Benz SUV has been renamed from GLK to GLC, and this versatile SUV represents a big step forward on several fronts. On a technical level, the GLC clearly makes its mark with the excellent standard of safety that is a brand hallmark, featuring state-of-the-art assistance systems. The AIR BODY CONTROL multi-chamber air suspension is unparalleled in this segment, offering the combination of DYNAMIC SELECT engine and suspension modes together with 4MATIC permanent all-wheel drive. This increases both ride comfort and agility, regardless of driving surface. Visually, the body follows the clear and sensual design idiom which was demonstrated so successfully by the GLC Coupé showcar concept in Spring 2015, and which also serves as the standard for future SUV families. The design philosophy behind the new GLC essentially favors sensual purity and a modern aesthetic over the classic off-road look. The dynamic design exudes emotional appeal while also employing purist forms. Surfaces embodying a degree of tension and precise lines cite the clear design line followed by all state-of-the-art SUVs from Mercedes-Benz. The GLC represents a departure from its progenitor– the G-Class – but only in terms of appearance. On a technical level, it sets new benchmarks in all disciplines, and the mid-size SUV’s off-road capabilities remain as outstanding as ever. The side view showcases the almost coupe-like greenhouse, which together with the 4.6 inch (118 millimeter) larger wheelbase lends the GLC an elegant long profile. This impression is further reinforced by the gently sloping dropping line, which is a hallmark of the brand, and by the powerful shoulders. The rising lower feature line also enlivens the vehicle’s side view. 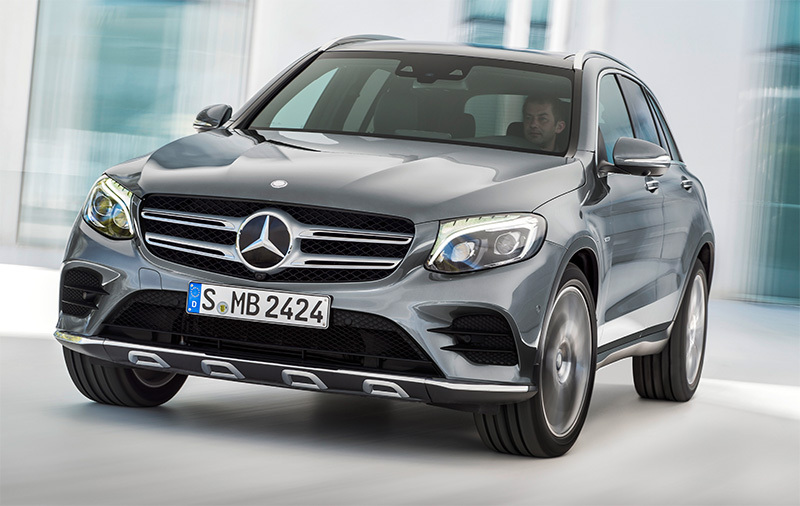 Matte black cladding in the wings, wheels up to a size of 20 inches (50.8 cm) and the optional side running board provide clear indications of the GLC’s off-road credentials. The paradigm shift in the area of design affects not only the outside appearance. The model change also signals a marked upgrade for the interior. A modern setting prevails, which is reminicent of the standard set by its bigger brother, the GLE. The new design idiom combines sensual purity with dynamic sportiness and embodies a new interpretation of modern luxury. 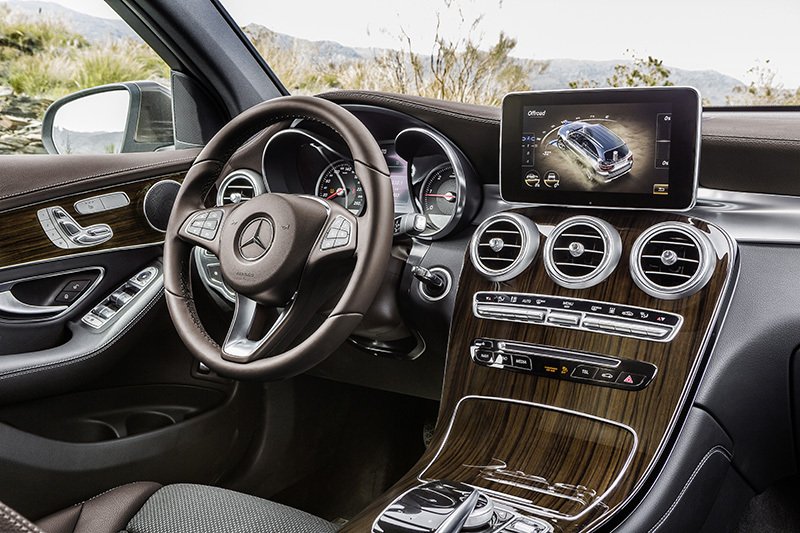 The GLC’s interior conjures up the feel-good atmosphere which is a brand hallmark courtesy of high-class materials featuring a hand-crafted character, such as nappa leather or open-pore wood trim, meticulously finished details and an appealing overall touch and feel. Last but not least, substantially more space is available for occupants and luggage. The optional large-area panoramic glass roof further enhances the light and airy feel inside. A key focus of the totally new interior design is the dashboard and the center console with its flowing lines and large, one-piece panel performing an elegant sweep from the center air vents to the armrest. These clear-cut lines create a feeling of open space and establish a purist, modern vibe. The newly developed innovative touchpad in the handrest over the rotary pushbutton nestles ergonomically in the center console. As on a smartphone, this provides for very simple and intuitive operation of all the head-unit functions using finger gestures. The touchpad also permits letters, numbers and special characters to be entered in handwriting. A centrally positioned media display is partially integrated above the center console. Five round air outlets with a metallic “cool touch” effect lend the dashboard a sporty air and create an interesting contrast to the warm look of the other materials. Mercedes-Benz has applied an extensive package of measures to enhance the GLC’s energy efficiency and performance substantially. New drive systems, outstanding aerodynamics and intelligent lightweight design are the primary factors behind the vehicle’s fuel efficiency. 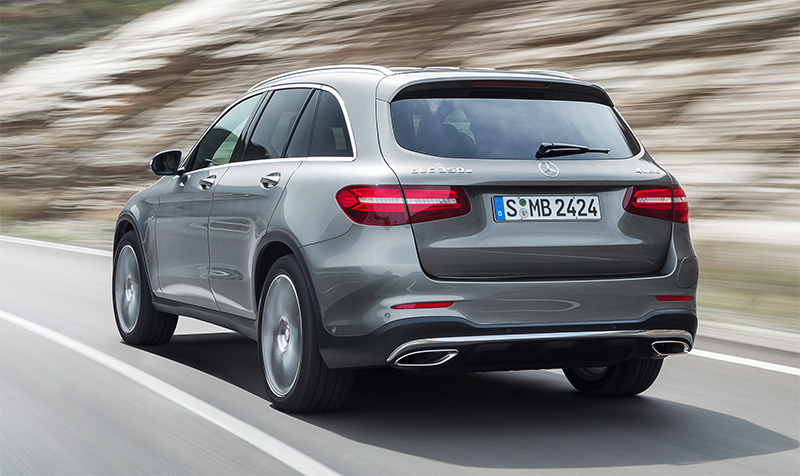 In the United States, the GLC 300 and GLC 300 4MATIC will be powered by a 2.0 liter inline 4 cylinder engine. The preliminary data shows that this fuel efficient powerplant will produce 241 hp @ 5,500 rpm and 273 lb-ft of torque @ 1,300-4,000 rpm. The design transition has also bestowed superlative aerodynamics on the new GLC. With a global Cd value of 0.31 (GLK 0.34) and total aerodynamic drag of 0.794 (GLK 0.87), it sets a clear benchmark in this segment (NOTE: this is a global aerodynamics figure, which is TBD for the U.S. market and related larger standard wheels, which will differ). Apart from the vehicle’s substantially more aerodynamically efficient basic shape, this exceptional aerodynamic performance also results from a host of solutions relating to points of detail, such as sealing of the radiator and headlamp surrounds, a radiator shutter, the extended roof spoiler or the optimized underbody panelling. Despite markedly larger outer dimensions, a longer wheelbase and a more extensive scope of equipment, the vehicle’s weight has been cut by 176 pounds (80 kilograms). The main contributory factor to this reduction is the totally new body, which is 110 pounds (50 kilograms) lighter than the smaller GLK counterpart, thanks to an intelligent mix of materials comprising aluminium and high- to ultra-high-strength steels. Aluminium components additionally reduce the weight of the chassis, which also benefits ride comfort due to the attendant reduction in unsprung masses. The optional AIR BODY CONTROL full-support multi-chamber air suspension features spring elements in lightweight yet robust glass-fiber-reinforced plastic, which reduce the system weight in comparison to conventional air suspensions. The use of the new compact transfer case as an add-on module and the 9G-TRONIC with its magnesium transmission housing both result in a reduction in weight of 26 pounds (12 kg) in comparison to the previous model. The new GLC features the AGILITY CONTROL suspension with steel springs and a variable damping system as standard. The GLC is the sole model in this market segment to offer the option of fitting the chassis with a full-support multi-chamber air suspension system and electronically controlled, continuously adjustable damping. The AIR BODY CONTROL suspension combines excellent driving stability and sporty agility with optimum comfort and outstanding off-road capabilities. Specific characteristics are pre-selected according to the settings of the DYNAMIC SELECT driving dynamics program. In Sport+ mode, the GLC’s occupants feel as if they are sitting in a sports car with a high level of lateral dynamics due to the tauter connection of the chassis, which is additionally lowered by 0.6 inches (15 millimeters). Comfort mode offers the very opposite ride experience, focusing on particularly comfortable running with soft connection of the chassis. To ensure maximum driving safety in this mode, the spring and damper forces adapt within 60 milliseconds in response to sudden evasive manouvers. Further benefits of the system include reduced rolling during cornering, automatic level control and lowering of the load compartment sill for convenient loading and unloading. The basic equipment on the all-new GLC already includes numerous details adopted from higher vehicle categories. Pioneering assistance systems such as COLLISION PREVENTION ASSIST PLUS, Crosswind Assist, Active Highbeam Assist, ATTENTION ASSIST or an ESP® system with Dynamic Cornering Assist all feature as standard. The optional latest-generation Driver Assistance Package further reduces the driver’s workload while enhancing safety for the passengers, with facilities including DISTRONIC PLUS with Steering Assist, PRE-SAFE® Brake with pedestrian detection, BAS PLUS with Cross-Traffic Assist, Active Blind Spot Assist, Active Lane Keeping Assist and PRE-SAFE® PLUS. For the interior, there is a choice of various combinations in MB-Tex, leather or nappa leather in black, silk beige, espresso brown, saddle brown and platinum white pearl (designo only). Standard wood trim is brown linden wood with distinctive dark vertical black lines, with optional trims for the USA being black open-pore ash, burl walnut wood in high-gloss brown. In comparison to its predecessor, the new GLC is substantially more spacious for front and rear occupants alike. The increase in the size of the GLC in comparison to the previous model has been translated effectively into useful interior space. Almost all key comfort factors have been improved – substantially in some instances – above all the space on the rear seats. An impressive amount of legroom – the space between the front seat backrests and the rear seat – is now available, following a very sizeable increase of 2.2 inches (57 millimeters). More space is also available for the front occupants, who benefit from a generous increase in shoulder and elbow room. By means of intelligent packaging and perfect seat geometry, the interior designers from the Mercedes-Benz Technology Center (MTC) have even managed to conjure up 2.2 inches (57 millimeters) of additional space here – although the vehicle’s width has only grown by 2.0 inches (50 millimeters). Another comfort criterion – entry and exit space for the rear passengers – has also been increased substantially, with 1.3 inches (34 millimeters) more foot space now available for the purposes of entering and exiting the vehicle. In order to assess the aeroacoustics, which represent the crucial comfort parameter particularly at higher speeds, the development engineers examined the GLC’s psycho-acoustic properties. In addition to the high-frequency wind noise, the low-frequency components and, in particular, speech intelligibility are considered and optimized here. In their development work, the engineers devoted special attention to the air flow around the body of the vehicle, the sealing systems at doors and windows and the bodyshell. The focus in this work is not solely on the absolute sound pressure level (dB(A)). Rather, the onus is on creating the most homogeneous, harmonious possible overall acoustics. This means that neither certain frequency ranges nor individual components or areas of the vehicle must be allowed to play a dominant role. From a speed of around 75 mph (120 km/h), wind noise is the dominant acoustic factor, while tire and engine noise play a less important role. A comparison with the E-Class shows how successfully the aeroacoustics engineers have “tuned” the GLC. The wind noise index, WI – a dimensionless figure to classify aeroacoustic quality – is at the same pleasant level in both objective and subjective terms. Featuring a totally new chassis and suspension, the new GLC clearly surpasses its predecessor’s performance. Numerous design measures have led to a further improvement in suspension and ride comfort accompanied by excellent driving dynamics and agility. Key measures here include the switch from a three-link to a four-link front suspension, the increased track width at front and rear and the larger tire sizes of up to 20 inches (50.8 cm). The elastokinematics have also been optimized and the use of numerous aluminium components on the front axle and the five-link rear axle has resulted in weight savings while at the same time enhancing stability. Comfort mode offers the very opposite ride experience, focusing on particularly comfortable running with a soft connection of the chassis. To ensure maximum driving safety in this mode, the spring and damper forces adapt within 60 milliseconds in response to sudden evasive manoevers. Sport increases the sporty settings for springs and dampers, and ride height is lowered. Finally, in SPORT+ mode the GLC’s occupants feel as if they are sitting in a sports car with a high level of lateral dynamics due to the tauter connection of the chassis, which is additionally lowered by 0.6 inches (15 millimeters). INDIVIDUAL – configuration of the driving experience according to personal preferences, within the bounds of combinations providing for safe and effective driving dynamics The COMFORT, SPORT and ECO settings for drive system, suspension and steering can be activated and combined according to personal preferences. Weight advantage – magnesium housing of the 9G-TRONIC is retained with the add-on solution, resulting in weight savings of around 26 pounds (12 kilograms) for the overall system compared to the integrated variant with aluminium housing which was employed on the previous model. A key factor behind the GLC’s economic efficiency is the weight-shedding program that the vehicle has undergone. Despite markedly increased exterior dimensions, a longer wheelbase and a broader scope of equipment, the vehicle’s weight has dropped by 176 pounds (80 kilograms). The main contributory factor here is the totally new hybrid material body, which introduces innovative lightweight design into volume production. As a result of the intelligent mix of materials spanning aluminium, high- to ultra-high-strength steels and robust plastic, the foundation of the GLC is 110 pounds (50 kilograms) lighter than its substantially smaller predecessor – while at the same time rigidity has been increased for excellent handling, noise and vibration comfort has been optimized and crash safety has been further enhanced. Adaptive Highbeam Assist Plus – allows the main-beam headlamps to be kept on permanently without dazzling traffic by masking out other vehicles in the beams’ cone of light. The virtual bird’s-eye view shows an aerial view of the GLC and the surrounding area three meters to the front and rear and 8.2 feet (2.5 meters) to the sides of the vehicle. Display of perspectives which are not actually physically possible. For example, when manoevering in a parking garage with a low ceiling a bird’s-eye view of the GLC and its surroundings are shown from a height of over 9.8 feet (3 meters), although the ceiling is actually only a few inches above the vehicle. Visualization of obstacles below the vehicle’s belt line, which are not visible to the driver. The color of the GLC on the COMAND display always corresponds to the vehicle’s actual paintwork. Also new is the Head-up Display (HUD). The HUD displays important information directly in the driver’s field of vision on the front windscreen, thus providing for clear legibility and less distraction from the road ahead. The system provides information on speed, posted speed limits, navigation instructions and messages from the DISTRONIC system. Additional strut made of high-strength steel between the damper dome and windscreen cross-member on the driver’s side which distributes the load from forces in the upper side member plane and reduces steering and pedal intrusion in the footwell. BAS PLUS warns when pedestrians are detected in the danger zone by the stereo multi-purpose camera. The PRE-SAFE® Brake with pedestrian protection triggers autonomous braking when the system detects a pedestrian in the danger zone and the driver does not react to the system’s warnings. This pedestrian detection, in conjunction with the optionally available Driver Assistance Package represents a milestone in preventing accidents with pedestrians and/or reducing their consequences. Dr Ernstberger, the new GLC has an impressive new design line. Does the vehicle’s technology live up to what its form promises? So, in terms of the new GLC’s driving dynamics, where exactly do its strengths lie? Is it more of a cross-country vehicle or a sporty shooting brake? On the subject of the interior, it’s an all-new world here as well, isn’t it? Is that not a contradiction – ever lighter vehicle bodies and ever greater passive safety? Mr Lührs, Mercedes-Benz is continuously expanding its SUV range – the new GLC brings the number of models to six now. Are there no overlaps here – what is the role of the new GLC? When will the GLC be available – can you tell us anything about the prices yet? “The GLC will be available in Europe from mid-September, to be followed successively by the other markets (MY2016 GLC300 and GLC300 4MATIC launches at US dealers in November 2015 with pricing TBD but at similar levels to the GLK).